This name derives from the Biblical Greek “Elisábet (Ελισάβετ)”, a form of the Hebrew name Elisheva ('ĕlı̂ysheba‛), which in turn is composed of two elements: the “ʾēl” (God, the God of Israel) plus “sh'vu'a (sh-b-ʿ)” (oath). In turn the name means “my God is an oath, my God is abundance”. shavu'ót (plural form) is a Jewish holiday that occurs in the spring, a harvest festival, also commemorating the anniversary of the giving of the Ten Commandments to Moses and the Israelites at Mount Sinai. This name and its variants are spread all over the world. 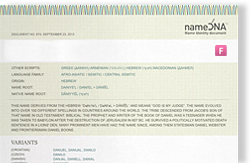 The name appears in the Old Testament as the name of Aaron's wife "Elisheva", and in the New Testament as the name of the wife of the priest Zechariah and mother of John the Baptist. Linked to this root we can find: Elizabeth I, queen regnant of England and Ireland, Elizabeth of Hungary (Erzsébet), princess of the Kingdom of Hungary and Elizabeth of Aragon (Elisabet in Catalan, Isabel in Aragonese), queen consort of Portugal, a tertiary of the Franciscan Order and is venerated as a saint of the Roman Catholic Church. Traits associated with the number 3 include advanced social skills and articulation. People with name-number 3 are delightful to speak to and are often successful orators or writers. They have a colorful imagination and enjoy life to the fullest. 3: The number of the Solar Plexus Chakra "Manipura"
Yellow. The centre of our being - the color of sunshine and the color of the third energy centre - the solar plexus chakra. The main energy of yellow is intellect. Do you like yellow color? Discover what yellow means and how it manifests in your body, mind, heart, and spirit. The color yellow relates to acquired knowledge. It is the color which resonates with the left or logic side of the brain stimulating our mental faculties and creating mental agility and perception. Being the lightest hue of the spectrum, the color psychology of yellow is uplifting and illuminating, offering hope, happiness, cheerfulness and fun. In the meaning of colors, yellow inspires original thought and inquisitiveness. Yellow is creative from a mental aspect, the color of new ideas, helping us to find new ways of doing things. It is the practical thinker, not the dreamer.